"Hi, I'm PC Savile from the Metropolitan Police Service. We're looking for News... News from Paddington?" "What a weird name. Afraid I don't know anyone like that. What happened?" "Well, we've been forced to arrest some people who were harassing some girls around Chinatown..."
"They kept following them and saying they want to... bobajam?" "And said that they've been told to not mention News from Paddington?" "Well, that's terrible, sir, but I've never heard of News from Paddington." "Alright then, thanks. Oh, do you know of any good places to eat around here?" "Okay. Well, if you hear anything about News from Paddington, give me a call on this number!" Damn, that was close! I told you guys to be careful! Oh well, let's see what happened this week. News from Paddington went to the UCL freshers' fair and pretended to be a student (there is this sweet spot of aging where neither bars nor Universities ID you). The first victim of News from Paddington was the UCL Energy Society, which News from Paddington signed up for as a certain James Smith. If any of the readers know James Smith, a second-year at UCL, please apologize to him on News from Paddington's behalf. As a consolation, he is eligible to be treated to a lunch in Chicken Cottage of value up to £3. News from Paddington recommends an innovative burger from which Chicken Cottage has removed all buns -- it consists of a piece of chicken between two pieces of chicken. It's really good! -- "Join the scuba diving society!" -- "No, thanks, I'm afraid of water." -- "Haha, funny, this sheet for the sign language society says 'Sign-up sheet' on it!" -- "Sign up for the European Society!" -- "Okay!" -- "It's only 5 pounds!" -- "Actually, I forgot my university card at home :("
-- "gives flyer Join the UCL Marxists!" -- "takes flyer, in a Russian accent Thanks, comrade!" -- "How did you find the Fair? Would you like to fill out this survey?" -- "Sure! gives the nicest answers ever and says 'better than the last year's fair!' in the end"
There was even a stage there! News from Paddington saw the Kendo society. A Kendo spar involves taking turns to 1) yell at the opponent 2) hit them with a stick. The yelling is especially funny when girls do it. This is how News from Paddington sounds like when the alcohol in its fridge runs out. Then News from Paddington miraculously met the girl it scared off last week with its friends. News from Paddington contemplated saying hi again and seeing if she would give up her hard-earned place in the queue, but decided not to. News from Paddington is really bad with the ladies. The time has come for supermarkets to start charging for all plastic bags. The time has also come for News from Paddington to start showing the middle finger to the checkout machine and carry all of its shopping without a bag. News from Paddington, alongside every other room in its accommodation, got a letter! The letter was from News from Foxtons and they were wondering if News from Paddington wanted to rent out its room. News from Paddington likes its room too much to rent it out and doesn't own it anyway. News from Paddington was sitting in the Tube once with its friend opposite a dodgy-looking guy. News from Paddington then stood up and started walking to exit the carriage. The dodgy-looking guy for some reason stood up and ran away from News from Paddington towards a different exit. When he saw that News from Paddington simply exited the train, he said "Oh come on!" and walked back to his previous seat. Did News from Paddington and its friend look like ticket inspectors? Hopefully. Next up, it's this week's culinary adventures! Guess what's located on University Street. Correct! Guess what else is located on University Street. It's Japanese Canteen! It's a canteen that serves Japanese food! It's really good! And good value for money! Five Paddington points out of five. News from Paddington even got some free olives, peppers and bread. It's really good! But not good value for money. Four Paddington points out of five. Asadal on High Holborn. It's a Korean BBQ place where the chefs can't be arsed to cook the meat, so they give the raw meat to you and place a hot stove on your table. Then also hit you with a service charge. The food is good though. Three Paddington points out of five. Bartending with News from Paddington! Tired of making Sidecars and trying to dispose of Grand Marnier by pouring it into tea, News from Paddington explored the exciting field of mixology some more. The Coffee Cart: make a Sidecar and add two tablespoons of instant coffee. Shake in a cocktail shaker. Be disgusted. Two Paddington points out of five. A Trolley Of Light Refreshments Is Available On This Train: take one part Coffee Cart and add five parts Diet Coke. Shake in a cocktail shaker. Regret when it foams up. Wait for five minutes and drink. It magically is much better! Four Paddington points out of five. The Trainwreck: make a Sidecar, but use 2/3 parts of Waitrose™ Zesty And Bright™ 30% Mexican™ Lime Juice Cordial instead of 2 parts lemon juice. Add 5 parts Diet Coke. Drink. Give it five Paddington points out of five. 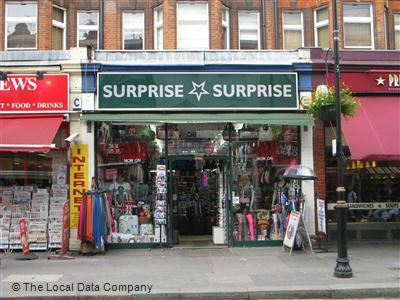 This edition of News from Paddington was brought to you by Surprise Surprise on Queensway. "Surprise Surprise on Queensway: Surprise Surprise! It's Surprise Surprise!"